sortemetstellascuba | Kg. Genting, Tioman Island, Malaysia. 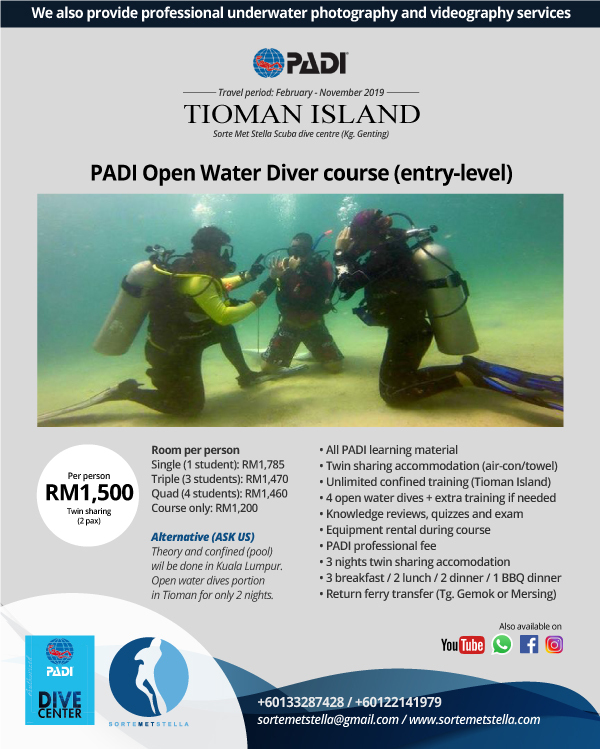 We provide PADI diving courses, trips and dive equipments in Malaysia. E-mail: sortemetstella@gmail.com Contact: +60122141979 At SORTE MET STELLA, we provide PADI diving courses from: • Discovery Scuba Diving • Junior Open Water Diver • Open Water diver • Advanced Open Water diver • Emergency First Responder (EFR) • Rescue Diver • Divemaster We also provide diving trips and dive equipment. You may call us at +60122141979 or email us at sortemetstella@gmail.com for more info. Relax. Let us do the hard work for you. Sorte Met Stella Scuba (Tioman) – PADI dive centre (S26090). Fun dives packages. Relax. Let us do the hard work for you. 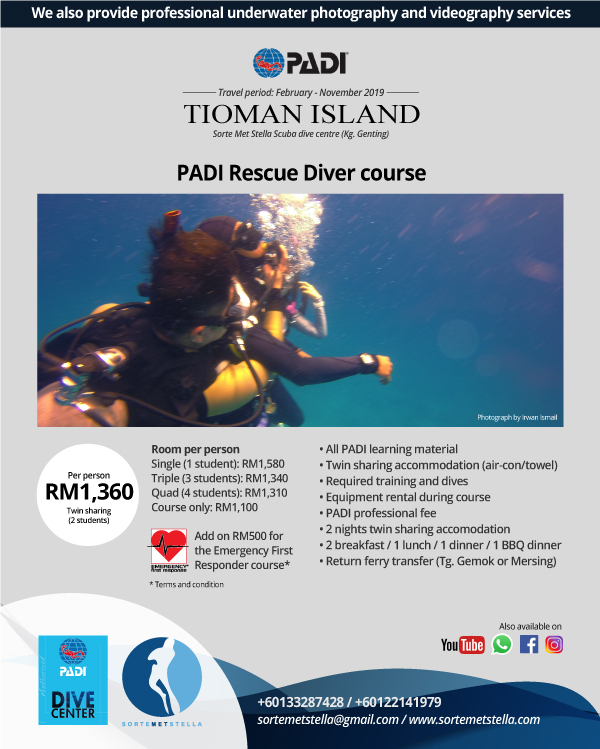 All you have to do is just dive, the rest will be handle by us. In Kg. Genting, Tioman Island, you don’t have to worry about meals as there is a few restaurants to choose from at a very reasonable price as Tioman is a duty free island. PICK A PACKAGE and relax. Enjoy your dive, enjoy your holiday as at Sorte Met Stella Scuba, we are a service oriented dive centre. 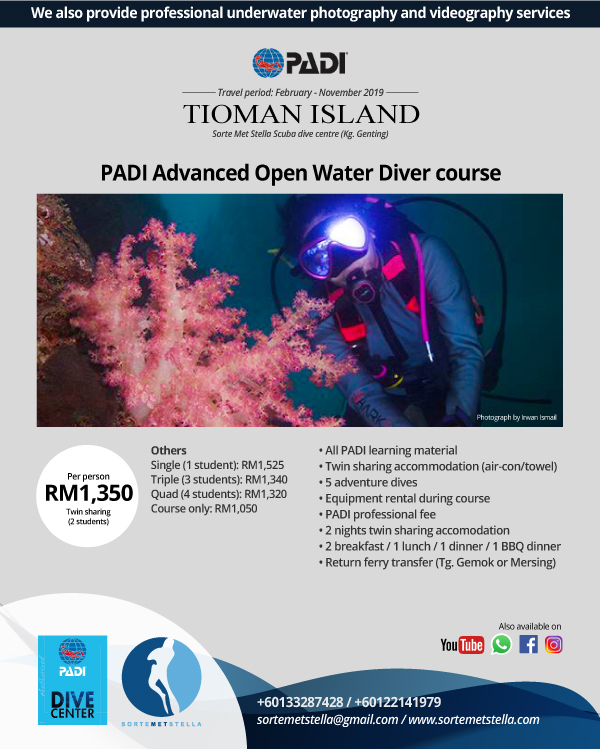 Call or whatsapp us for bookings at +60133287428 / +60122141979 and our dive professionals will attend to your enquiry. Hope to hear from you soon!